80 / the tasting panel / september 2017 SPARKLING P roducing a wine so successful that your brand becomes practi- cally synonymous with the variety is a good problem to have, but it does necessitate extra effort to ensure the rest of your portfolio isn't overshadowed. With its Pinot Grigio a longtime market leader, Santa Margherita is confronting that risk head-on by showing consumers its bubbly side. The timing couldn't be better. As Santa Margherita USA Marketing Director Vickie Perez-Carlotto observes, "Bubbles are much more at the forefront of consumers' minds" these days—a trend she attributes to Millennials and their influential penchant for living in the moment. 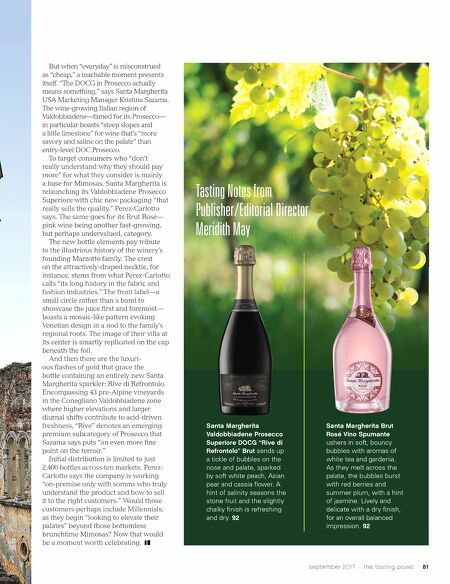 When "every occasion is special," as she puts it, consumers can see sparklers as everyday wines: Take Prosecco, which has enjoyed a newfound surge in popularity in recent years thanks, in Perez- Carlotto's view, to the American "brunch craze." 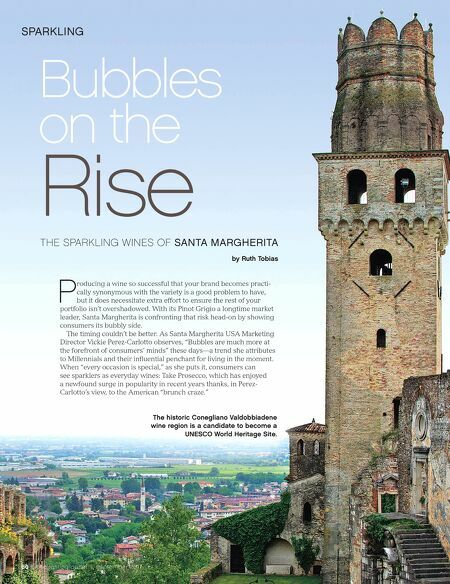 Bubbles on the Rise THE SPARKLING WINES OF SANTA MARGHERITA by Ruth Tobias The historic Conegliano Valdobbiadene wine region is a candidate to become a UNESCO World Heritage Site.